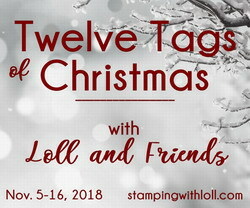 Darnell's tag information and how to's are listed on her blog (link provided below). Click HERE to be forwarded to Darnell's blog post. I never tire of trees & both of you used them so beautifully! I'm totally in love with your background, Loll! What a gorgeous, rich color you achieved with this technique. Love that background! The crinkles remind me of the ice crystals that form on the windows. The white trees look beautiful against it. Darnell's tag is charming. Love those unique die cut trees. OMG!! Your cling wrap background is simply mesmerizing Loll. The perfect backdrop for those gorgeous trees. Maybe this one is my favourite!! Love the vibrant blue and white - could look at it all day! Another really beautiful tag, Loll! I love the pattern that was created using cling wrap with Brushos...I must try it! Love your forest of snowy trees, too...such a lovely winter scene! What a perfect background for these icy trees! Love the vivid blue and the wonderful patterns the cling wrap made! I do love that beautiful blue and white tag. The trees are beautiful. Beautiful winter scene, Loll, and I love the die cut trees Darnell used! Pretty tags! Both of your tags are nothing less than stunning! What a wonderful challenge Loll!! A twofer fabulous post, Loll! Your tag is absolutely stunning. Wow! That technique makes the sky look like it is glowing. Wow! And the white just pops. You are amazingly talented. And Darnell's tag is just as beautiful. You are a dynamic duo of tag makers. Thanks so much for sharing! Oh Loll, this is wonderful. 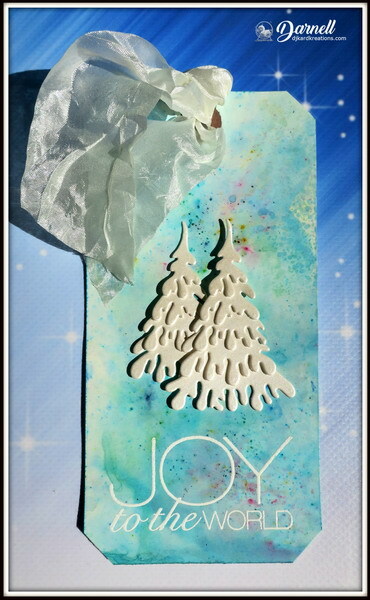 You have the greatest results with cling wrap and the embossed trees are gorgeous. I hope when you do your teaching tour of the USA you will come and stay with me several days. I cannot master this but I do have a huge can of spray starch in case the mood to iron ever strikes me. oh wow your tag is amazing that colour blue is just beautiful. A gorgeous tag too from Darnell. Wow, amazing cling wrap effect, Loll! It's so clear and flowing, and it makes a perfect icy background for the snowy forest. Love the blue/purple colors too. 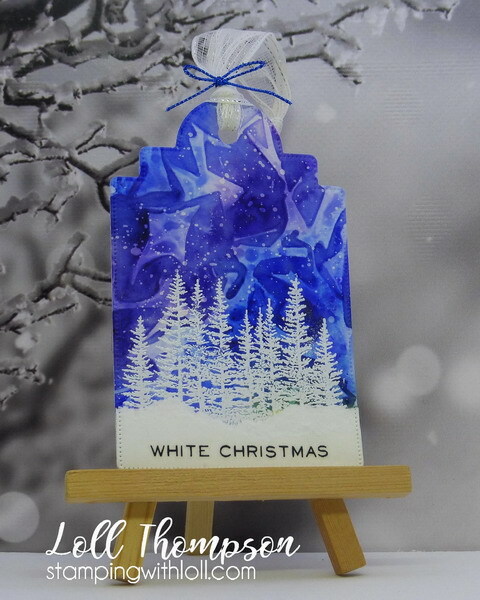 Lovely blue background- looks like snow crystals, and those trees are fantastic Loll! Wow. Wow, that sky on your tag is breathtaking! The snowy trees and the snow drift provide a fantastic contrast! WOW! Your background looks like crystal !! I love this tag.